Gary Seven talking to his snarky computer and shapeshifting cat. This is the best known by far, although not usually for good reasons. You see, the writing was on the wall for the original Star Trek as the second season came to a close. They were lucky to get that far, and no one expected a third. Gene Roddenberry was kind of checking out already, and he had very little to do with the eventual third season anyway. Instead, he decided to try to get his next project off the ground by using Trek for leverage. 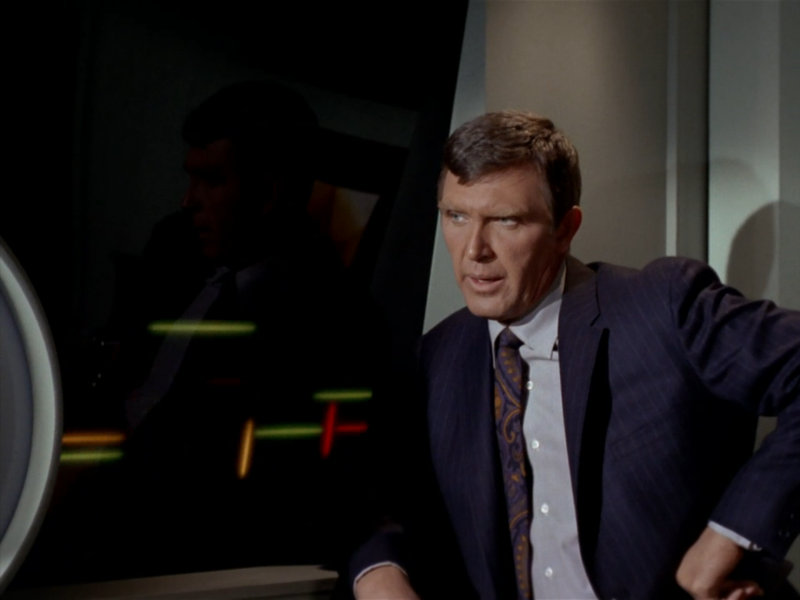 That led to the creation of a backdoor pilot, resulting in the episode called “Assignment: Earth.” The script for the pilot had already been shopped around some, to no avail, so Roddenberry shoved Kirk and Spock in via a convoluted “historical observation mission,” something never seen before or since in all the years of Trek. Having wound up back in 1968, the duo meet up with a man named Gary Seven, who was raised by aliens and sent to Earth to watch out for the growing human race. They show off how cool he is by having him withstand the Vulcan Nerve Pinch and beat up some red shirts. He’s got a talking computer and a transporter and a special transforming cat and an ordinary secretary. Kirk assures us, as the Enterprise heads off to its proper time, that Gary Seven will go on to have many wonderful adventures, but if he does, we never see it. Gary Seven and his friends are never mentioned in Trek again. 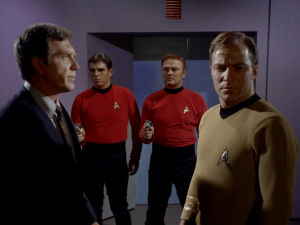 The episode today is mostly remembered for accidentally predicting the assassination of Martin Luther King, Jr., but had it been more popular, it could’ve been the start of the first Trek spinoff. If Star Trek had been canceled at season 2 and this picked up, perhaps it would’ve taken on some of the Trek writers and become known for the kind of social commentary and optimism that Trek came to represent. After all, that was the premise of the show: to preserve and ensure the creation of humanity’s future by stopping evil Omegans. 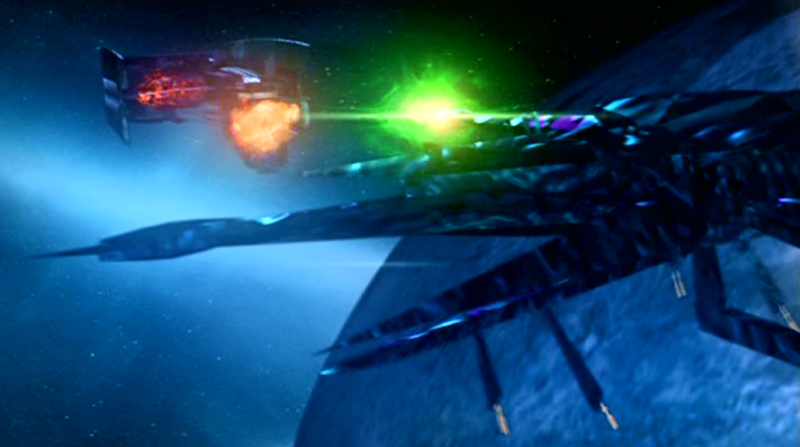 It’s interesting to note that this idea is shockingly close to the Temporal Cold War arc seen in Star Trek: Enterprise. Would Assignment: Earth have been the one to get a movie in the late 70’s? Is it possible that out there in the multiverse, there’s some world where Star Trek is mostly remembered as “that show that launched Gary Seven?” Maybe. Probably not, though. Babylon 5 already had its shot at a spinoff with Crusade, and given how torturous the process seems to have been for poor JMS, one wouldn’t be surprised to hear he was uninterested in trying it again. But a few years passed and SciFi Channel had been treating him much better. They hadn’t been able to revive Crusade, mostly due to TNT’s spite, but they were willing to try another spinoff. And thus the pilot-turned-TV-movie Babylon 5: The Legend of the Rangers was born. Heck, it actually had a separate episode title, “To Live and Die In Starlight,” as if it was sure to be the first of a series. It focuses on a ship of inexperienced Rangers, a group that was first introduced in B5 proper and included divisive character Marcus Cole. They encounter a threat from beyond the galaxy on what was supposed to be a simple mission. No doubt there would inevitably have been a bigger story arc, much like was planned for Crusade or executed in B5, but we never saw it. As far as the pilot movie itself goes, it has its fans, but wasn’t particularly popular and thus wasn’t picked up. This is a more interesting one to think about, because had it continued, it likely would have run alongside the reimagined Battlestar Galactica, and if Legend ended up anything like Babylon 5, it would’ve made for a truly epic block of dark and creative sci-fi. Even if it didn’t do very well on its own, being paired up with the popularity that show managed to garner could have kept it going for a few years, at least. Heck, we might have kept some part of the B5 universe on the air to this day. With as many new characters and arcs, it was basically a spinoff anyway. As Stargate SG-1 came to the end of its 8th season, the future wasn’t certain. Richard Dean Anderson wanted to step back, Don S. Davis was retiring, and the writers had already written the last 3 season finales in such a way that they could serve as series finales should the show not be renewed. Tired of leaving the show in such uncertain terms, they wanted to try something different. SciFi Channel wanted more Stargate, and the showrunners saw their opportunity. How about, instead of continuing SG-1, we do a spinoff that picks up exactly where it left off with a different focus–Stargate Command? It could use the same sets, have some of the same characters carry over, but still be free to create its own stories by introducing new characters and turning the show into more of a rotating ensemble deal, taking some of the load off RDA. SciFi seemed to be afraid that they’d lose fans by dropping the SG-1 part of the name, and insisted on keeping it, so instead of becoming a separate show, seasons 9 and 10 of SG-1 just feel like one. It’s really hard to predict how this change would’ve affected the franchise. SciFi was still creeping up on its imminent name change to “Syfy,” and its subsequent loss of faith in all science fiction in favor of ghost hunters, Sharknados, and wrestling. There had been a similar proposal to end SG-1 and carry on to Atlantis the season before, so it was definitely an idea they’d been floating for some time. Had Stargate Command become a series, and done at least as well as seasons 9 and 10 of SG-1, it’s likely Universe would never have been made, and the backlash the franchise suffered for that show’s change of tone wouldn’t have come to pass. Perhaps Command would still be on the air, or maybe Syfy would’ve killed it anyway by trying to air it against huge network shows the same way they killed Universe. Still, Warehouse 13 and Eureka managed to survive that period–maybe Stargate Command could have as well. There’s so little photographic evidence of it I had to take this one shot from Wikipedia. I’ve touched on this one before, as it’s the only episode of Doctor Who that doesn’t feature the Doctor or the TARDIS crew at all. With the way character rights work, especially in the U.K., it’s apparently possible for the writer of a particular episode to own control of the rights to anything that first appeared in an episode they wrote. This is why the estate of Terry Nation has to be consulted and dealt with each time the Daleks appear, and why those strange direct-to-video spinoffs about the Sontarans and the Autons were possible in the 90’s. This episode has to do with the former. The ’60’s were rife with Dalekmania, and Nation wanted to make the most of it and try his hand at bringing the Daleks across the pond. This episode was how: the sole standalone single-episode story of the Classic Who run, it served as an introduction to the wide alien alliance in this far-flung galaxy that had banded together to defeat the Dalek menace. The idea was to help establish the Daleks as something independent of the Doctor, to make that eventual break easier. Unfortunately, it’s one of the missing episodes, with absolutely no surviving footage. This is one that would’ve had a huge impact. 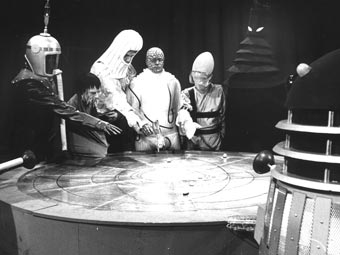 Everyone knew that Terry Nation was trying to shop the Daleks around, and so they’d begun searching for new nemeses for the Doctor (resulting in the creation of the Cybermen for the Second Doctor). Had they actually been taken away for a spinoff, a huge number of classic episodes would never have existed, and the impact on the show would be almost incalculable. Could Doctor Who have lasted until 1989 without the Daleks? It’s really, really hard to say; they’ve become so inextricably linked with the Doctor. The impact would likely have reached beyond Doctor Who as well, either keeping Blake’s 7 from ever being created or significantly altering the show. This is one spinoff that it’s probably for the best it never took off. You can read about the script for the would-be pilot here. Well, what do you think of these spinoffs that never came to be? Do you wish they’d had a chance to develop, or are you glad they never expanded? Are there any other aborted spinoffs you wish you could’ve seen? Let me know in the comments, or on Twitter @RetroPhaseShift. Do note, there will still be a real “What Could Have Been” at the end of the month, so stay tuned for that.